Back in May, I shared a layout about saying goodbye to our beloved interim pastor. For over two years, our church has been searching for just the right person to lead us and I'm thrilled that we finally have a new permanent pastor we adore. I'm sure I'll eventually share a layout about Pastor Karen's special installation service and Trevor's role in it. But in the meantime, I'm sharing the dessert I made for the welcome dinner. S'mores, anyone? 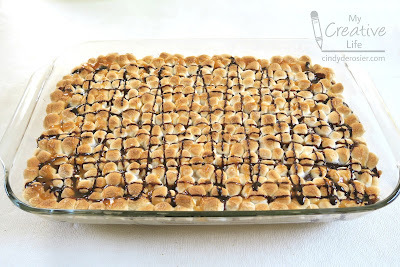 We were expecting a crowd for the service and dinner, so I wanted to bring a dessert that would feed a ton of people, be easy to serve on a crowded buffet, and be fine at room temperature for hours. Such an occasion would not normally be the time most people would experiment with making up a dessert they've never had before, but I am not most people. This is EXACTLY the time of occasion where I would invent a recipe and hope for the best! Fortunately, it turned out just as I'd hoped. 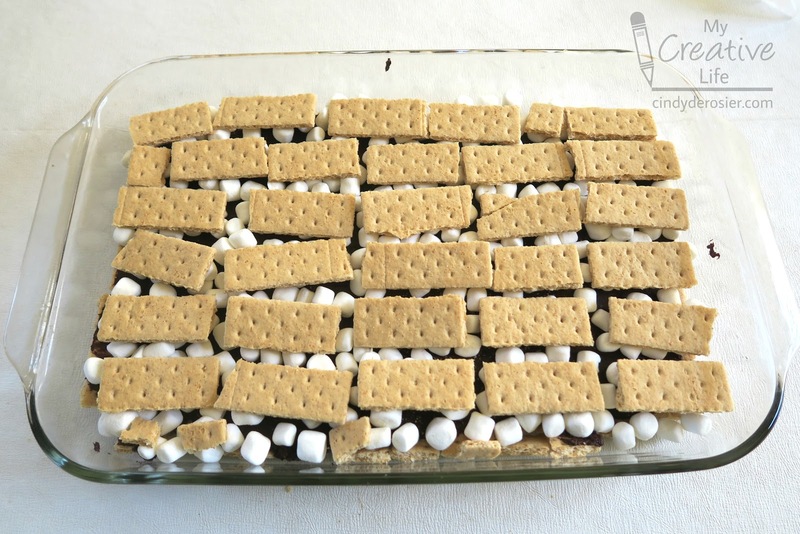 Choose your desired size of baking dish and line the bottom with graham crackers. 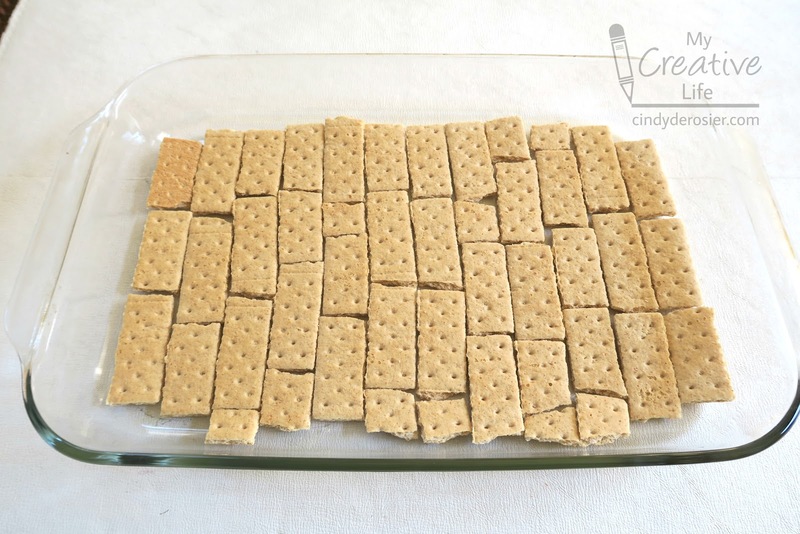 No butter first - just graham crackers. 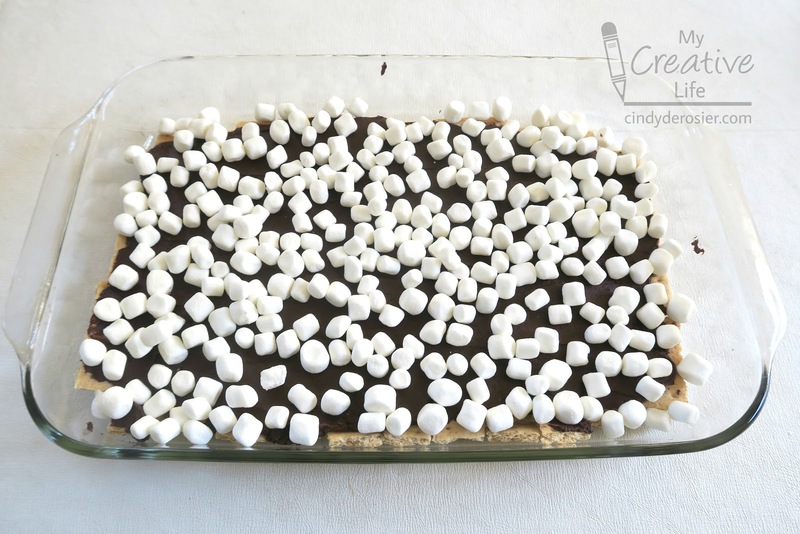 I used the gigantic 15" x 10" x 2" Pyrex dish (affiliate link here and elsewhere in the post). 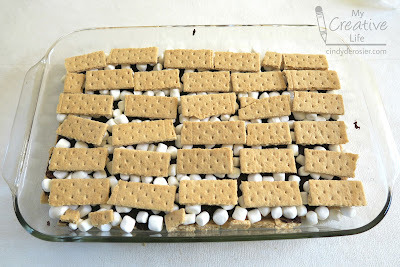 It took just over one sleeve of graham crackers to cover the bottom. Melt 12 oz. of unsweetened chocolate with 2 T. butter. (I used the microwave - high power for 30 seconds, stir, then another 30 seconds and stir. Repeat if needed.) When the chocolate and butter are fully melted, stir in 3 cups of milk. Add 2 cup of powdered sugar. Beat on high speed for 5 minutes until the mixture is light and fluffy like chocolate mousse. 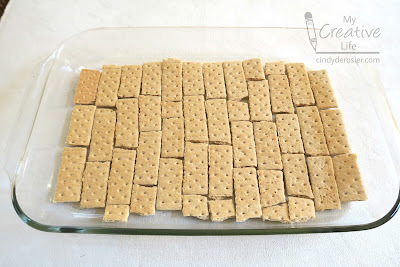 Spread HALF of the mixture on top of the graham crackers. 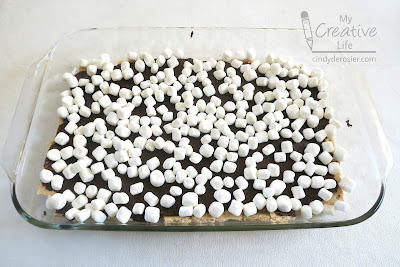 Sprinkle about 5 cups of mini marshmallows on top of the chocolate. the remaining chocolate, and another 5 cups of marshmallows. Obviously, scale everything down if you're not planning to feed a bunch of people. This casserole is surprisingly rich. Bake it in a 350°F oven for 20 minutes, keeping a close eye on it for the last few minutes. You want the marshmallows golden brown. 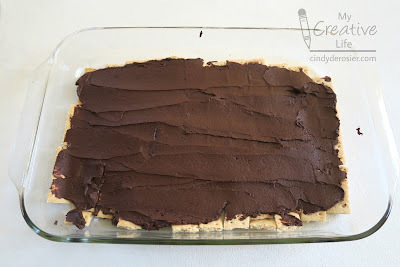 Since they go from white to golden to black quite rapidly, you want to remove them from the oven before the black stage. I ended up baking mine 23 minutes to get the perfect golden, toasty marshmallows. Finally, squeeze chocolate syrup and caramel sauce over the top. You can't see the caramel all that well in the photo, but it's there. And it pushes this dessert right over the top. 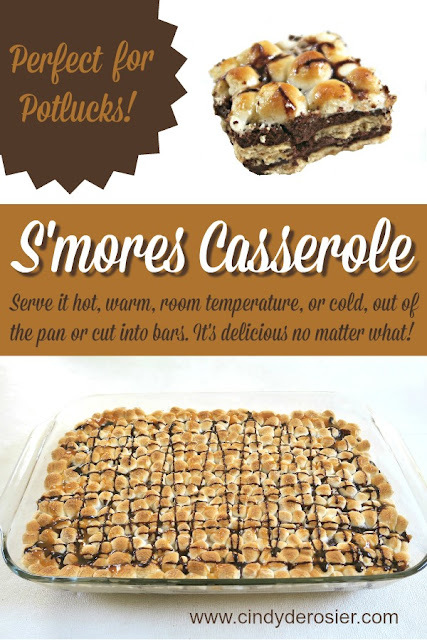 Now here's the true beauty of this casserole: you can serve it piping hot, straight out of the oven. Just spoon it onto plates. You can serve it warm also. Once it is completely cool, you can cut it into bars. 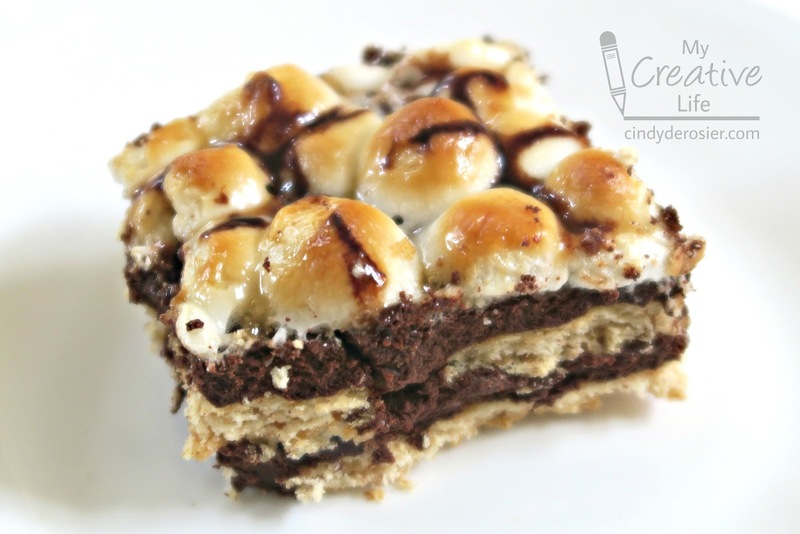 You can eat those bars as is, or put them on a plate and microwave them for 15 seconds for maximal ooey-gooey-ness. Delicious! And as you can see, after making my casserole, I made a pin to go with it. I need to add "playing with PicMonkey" to my list of hobbies. 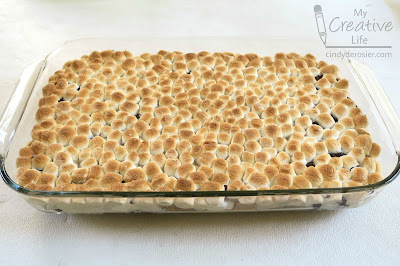 Do you have a go-to dessert for potlucks? Ohhhhhhhhhh this looks AMAZING!!!!!! Pinning!!!!! Looks yummy! Love how gung-ho you are about experimenting and trying out something new!